From the Director: Thank you all very much for a great audition. There is a lot of flexibility in this script and we will be adding scenes and songs as we work our way through the rehearsal period. So it is very important to be at rehearsals. There are a few people I would still like to hear sing. We will have a singing audition after the read thru. This will only involve a few people. I will let you know if I need to hear you. Thanks again. Looking forward to a great show. Wednesday, October 18, 6-8 p.m. Doors will open 15 minutes before auditions begin. Upon arrival, sign in and be sure audition form is submitted. Actors will have a head shot taken to help the director to identify each one. 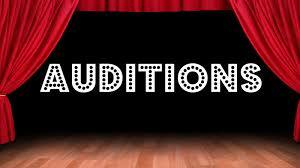 Actors will be taken in small groups to the stage to audition in front of the director (Bobby Bodford) and stage manager. This will take place on the stage, but behind the closed curtain. During the audition, actors will be asked to read from pages of the script. Also, actors may be asked to sing part of a Christmas song.